With only 3 days into the launch of the new Twitter related web site, Just Tweet It, created by designers Adelle Charles & Dani McDaniel. They have gotten some amazing feedback from the community and a lot of love has been spread. 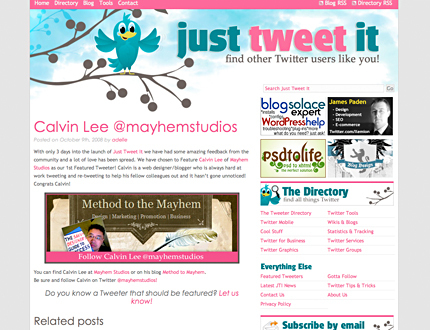 Just Tweet It have chosen to feature Calvin Lee of Mayhem Studios as their First Featured Tweeter! Calvin is a designer/blogger who is always hard at work tweeting and re-tweeting to help his fellow colleagues and it hasn’t gone unnoticed! Feel free to follow @mayhemstudios, @Adellecharles and @Dani on Twitter. Just Tweet It is a directory to find other Tweeters that share your interests, search for friends, and keep up with the latest Twitter tools, links and information. Just Tweet It was created by designers Adelle Charles & Dani McDaniel. They wanted to make it easier for people using the popular micro-blogging service Twitter to find other “Tweeters” with similar interests. Adelle Charles is a Designer & Blogger who runs Fuel Your Creativity & AdelleCharles.com. She is an obsessive email checker and highly addicted to Starbucks. Loves to add "fuel to the fire" any chance she gets. Her dogs Chino and Jameson jot down ideas for her while she's at work. They are obviously the secret to her success. Dani McDaniel owner of Anidan Design with over 8 years experience in web and graphic design. Dani loves to help people design their individual place on the internet. Dani specializes in css/xhtml and Wordpress customization, she can code a design you already have or help you to design a brand new one that sets you miles apart from your competitors!